Lt. D. H. Laing, son of Mrs. Cassie Laing, attended Laing Cons. No. 1 School; husband of the former Cora Taylor. 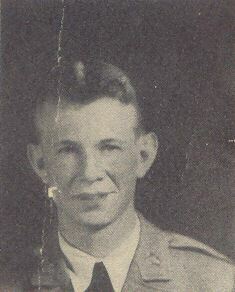 Entered Air Corps in May, 1942, trained in Maxwell Field, Ala., Mississippi, Louisiana, Florida; went overseas in Dec., 1943, served in England, was wounded in action in Germany in May, 1944, was German Prisoner of War eleven months; is now on duty in Selma, Ala. Awarded DFC, the Purple Heart, ETO Ribbon with three Battle Stars, Air Medal with dour Oak Leaf Clusters, Good Conduct Medal.